For every American polled who thinks they are going to Hell, there are 120 who think they’re going to Heaven. Author Randy Alcorn explains that Heaven isn’t our “default destination” and that specific preparation must be made if we are to safely arrive in Heaven. This optimism stands in stark contrast to Jesus Christ’s words written in the Bible: “Enter by the narrow gate. For the gate is wide and the way is easy that leads to destruction, and those who enter by it are many. For the gate is narrow and the way is hard that leads to life, and those who find it are few” (Matthew 7:13-14). But once that’s straight in our minds we’re ready to hear the good news of Jesus Christ-Jesus took upon himself, on the cross, the Hell we deserve so that we could experience for eternity the Heaven we don’t deserve! There are two possible destinations when we die—Heaven or Hell. Can we really know in advance where we’ll go? John, one of the writers of the Bible, said this: “I write these things to you who believe in the name of the Son of God that you may know that you have eternal life” (1 John 5:13). To sin means to fall short of God’s holy standards. Sin is what ended Eden’s paradise. And all of us, like Adam and Eve, are sinners. “For all have sinned and fall short of the glory of God” (Romans 3:23). Sin separates us from a relationship with God (Isaiah 59:2). Sin deceives us and makes us think that wrong is right and right is wrong (Proverbs 14:12). Sin has terrible consequences, but God has provided a solution: “For the wages of sin is death, but the free gift of God is eternal life in Christ Jesus our Lord” (Romans 6:23). Jesus Christ, the Son of God, loved us so much that he became a man to deliver us from our sin. “For God so loved the world, that he gave his only Son, that whoever believes in him should not perish but have eternal life” (John 3:16). He came to identify with us in our humanity and our weakness, but he did so without being tainted by our sin, self-deception, and moral failings (Hebrews 4:15-16). Jesus died on the cross as the only one worthy to pay the penalty for our sins demanded by the holiness of God: “For our sake he [God] made him [Jesus] to be sin who knew no sin, so that in him we might become the righteousness of God” (2 Corinthians 5:21). But God raised Jesus from the grave, defeating sin’s consequences and conquering death (1 Corinthians 15:3-4, 54-57). We cannot pay our own way. Jesus said “No one comes to the Father except through me” (John 14:6). “There is salvation in no one else, for there is no other name under heaven given among men by which we must be saved” (Acts 4:12). Because of Jesus Christ’s sacrificial death on the cross on our behalf, God freely offers us forgiveness. To be forgiven, we must recognize and repent of our sins. Forgiveness is not automatic. It’s conditioned upon confession: “If we confess our sins, he is faithful and just to forgive us our sins and to cleanse us from all unrighteousness” (1 John 1:9). Christ offers to everyone the gifts of forgiveness, salvation, and eternal life. “Let the one who is thirsty come; let the one who desires take the water of life without price” (Revelation 22:17). There’s no righteous deed we can do that will earn us a place in Heaven (Titus 3:5). We come to Christ empty-handed. We can take no credit for salvation. “For by grace you have been saved through faith. And this is not your own doing; it is the gift of God, not a result of works, so that no one may boast” (Ephesians 2:8-9). This gift cannot be worked for, earned, or achieved. It’s dependent solely on Christ’s generous sacrifice on our behalf. 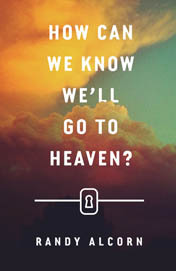 The How Can We Know That We’ll Go to Heaven? tract can be purchased from EPM’s online store. You are made for a person and a place. Jesus is the person. Heaven is the place. In this interview with Lee Strobel, Randy Alcorn discusses the reality of Heaven.